Beer is a widely consumed alcoholic beverage throughout the world and global production figures have shown an increasing trend during the last decade. In 2016, the United States was the second largest country in worldwide beer production with an amount of about 221 million hectoliters, following only China. The global beer market is characterized by key players such as AB Inbev, Heineken Holding, SABMiller, Kirin Holdings, and Asahi Group Holdings. AB InBev topped the ranking with sales amounting to about 45.6 billion U.S. dollars in 2017. The company's iconic beer brand Budweiser had a global brand value amounting to about 15 billion U.S. dollars in 2017. Bud Light and Heineken rounded off the most valuable beer brands in that year. On the U.S. beer market, about 34.17 billion U.S. dollars were registered in sales in 2016. About a third of the U.S. beer volume was sold through convenience stores. Grocery stores were the second most important distribution channel. In 2016, about 44 percent of the U.S. beer consumption was attributable to light beer. 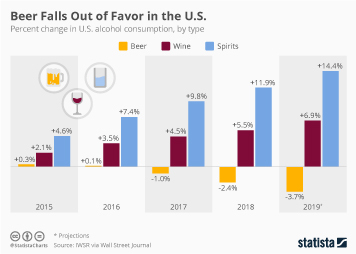 This result corresponds to the sales of the leading domestic beer brands the next year: Bud Light was the top ranked American beer brand, based on sales of about two billion U.S. dollars. That equaled a market share of about 18.4 percent among domestic beer brands. Beer imported to the U.S.
5. Brands in the U.S.
6. Consumption in the U.S.